I usually set an expectation for myself when it comes to how often I should go online, especially when I'm traveling overseas. But in reality, setting expectations don’t always go as planned because I'd still find myself checking my Facebook feed, and posting photos on Instagram. This usually happens when I'm waiting for my food to be served or while I’m on transit. Anyway, I was recently in Thailand for my birthday/honeymoon. I wasn’t always glued to my phone, checking stuff online throughout the trip. 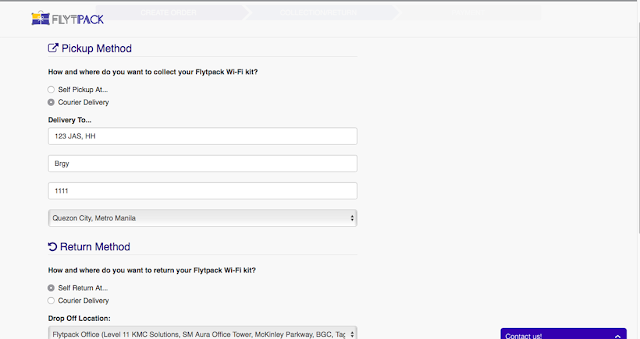 But it still helped that I had a FLYTPACK router with me, which was a lifesaver during inopportune times on the road. 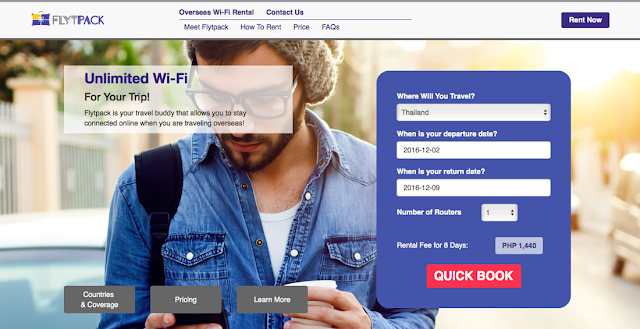 I've recently been on an 8-day travel in Phuket, Thailand, and was, unfortunately, not automatically covered by my mobile carrier's roaming service. I was on panic mode because the Wi-Fi connection in the airport had all of these inconvenient sign-up procedures. I was beginning to get worried, as I had no other means to contact my husband, who flew earlier than me. I was already thinking of buying a local sim, just so I can call and update him. But I remembered that I brought a portable Wi-Fi device, which I instantly put to the test soon after passing Immigration. I took out the router from its bag, and turned it on to check if I’d finally get lucky. And in a few minutes, FLYTPACK connected me to my Viber contacts. There were no installation and configurations needed, so the low-tech in me was able to figure it out right away. Flytpack is quite easy to use. It’s a personal wireless modem that connects any Wi-Fi enabled device/s to the Internet with a secure network connection. You just need to turn ON the router, and then enable the Wi-Fi function on your device. After that, search and select for the SSID on your device (mine was SSID: YouYouWZXE). Enter the password indicated on the router, and then wait for a few seconds, as you'll soon be connected when the Wi-Fi appears on the smart device. Don’t panic when your router doesn’t connect right away. You should turn OFF roaming and automatic notification updates for it to be recognized by your smart device. As per experience, my Apple gadgets were able to connect to Flytpack when I switched both to Airplane mode. It was that simple. All of our accommodations had access to free Wi-Fi. But we weren’t always cooped up in our lodgings, as we were mostly out discovering the beaches of Phuket (Kata, Karon and Patong), trying the local eateries nearby, and checking the ‘hip and happening’ spots in the area. Googled authentic Thai eateries in our area (mostly in Karon). Googled reviews that were left for restaurants, beaches, tours and other hip spots. Downloaded maps based on our locations. Booked a Grab Car via the Grab app, and tracked my trip to Phuket International Airport in real-time. Hooked up on Spotify while at the beach (a very nice experience enjoyed over good music and great-tasting, Chang beers!). Posted and shared real-time updates and photos on all of my social media accounts. Watched videos online without interruption or delay. I initially thought that the daily data limit for Thailand was too low (500 MB per day). But I wasn’t a heavy user, so I was still able to experience Flytpack’s fast and reliable connection without running out of data. Now, there were a few times when I had a hard time linking up to the router, especially in areas that are somewhat covered. But once I find a location where the signal is strong, I get to connect to Flytpack without a hitch. Since I was strapped for time, I requested for the Flytpack device to be delivered to my house. It would be advisable to make a reservation on their website at least 5 days before your flight. When you make a reservation, a few of your details will be requested like your travel details for starters (countries of destination, departure and return dates, number of routers). 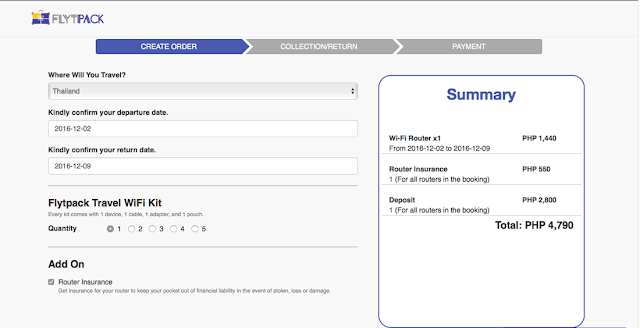 You’ll also be asked to click the ADD-ON button for the Router Insurance (P550), which you should consider availing. This will free you from any financial liabilities, should the router end up getting broken, lost or stolen. You'll also be asked on your collection and return preferences (self pick-up/return at Flytpack’s office or courier delivery to your chosen address). The last few details that will be asked are your personal details (name, phone number, email address), and your bank account information for the payment settlement (payee number, passport number, bank name, bank account number). From here, you can pick your payment method. All you need to do is pay, and you’re done! I was able to receive the Wi-Fi router in my home address two days before my flight. The package was secured in a denim pouch, and was ready to be hand carried to Thailand. It included the router, charging cable, universal charger, and user manual. The rental fee, by the way, started its meter on my first day abroad, and ended when I arrived in the Philippines. I also requested for the Flytpack device to be picked up from the same address, 3 days after my return flight in the Philippines. The pick-up was just as smooth and reliable. I was even provided with a waybill, as proof that the transaction was successfully made. Do take note that extra charges will also apply for courier deliveries (P120, 2-way), should you opt for this alternative. If you have time, you can also pick-up and drop-off the Flytpack device before and after your scheduled travel dates. Their offices are just located in Taguig. Asia Pacific: Singapore, Malaysia, Thailand, Hong Kong, Taiwan, Cambodia, Guam + Saipan, South Korea, Japan, Australia, China, Vietnam and India. You can check their discounted rates via their site, Flytpack.com. BETTER CONNECTIONS MAKE BETTER JOURNEYS! It's true what Flytpack said, "better connections make better journeys". I've proven this true and effective, especially when we were out and about the streets of Phuket. We’ve gotten lost along the way, and were in dire need of information to help us through. Good thing Flytpack was present throughout our entire journey, so we were able to get help online via its fast and reliable connection. It has definitely made our travel abroad super convenient and budget-friendly. So I’m definitely bringing one again on my next trip overseas.